Phyllis Madonnaâ€™s favorite holiday memory is getting married to her husband, Alex, 55 Christmases ago. It was actually a surprise for both of them: Mutual friends lured them to Las Vegas under the pretense of a holiday celebration. Both of them had grumbled a little over the prospect of having to take time away from busy schedules, but they made the drive from San Luis Obispo on Dec. 28, 1949. Before the young couple knew what was happening, they were standing in front of a poinsettia-covered altar at the Little Church of the West. â€œLo and behold, after we got there they had set up everything for us to get married,â€? Phyllis remembers. â€œThe exciting part was running around trying to get ready. He had given me a chartreuse, ribbon-knit dress as my Christmas gift, so I wore that.â€? CIRCA 1995 : Every year, the Madonnas host the fund-raising Womenâ€™s Shelter Benefit Show. 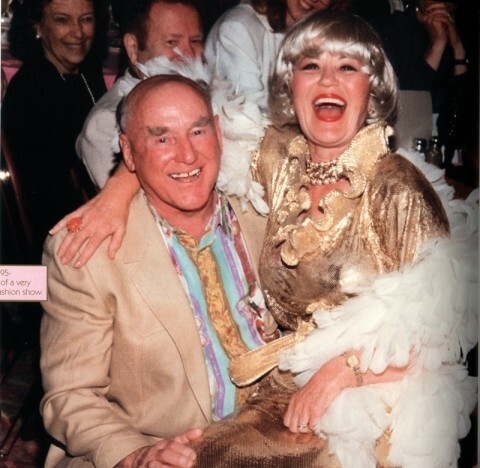 In 1995, with Phyllis dressed up to sing â€œHello Dolly,â€? she and Alex goofed around after the production. #Back home, the Madonnas spent their first few months at Alexâ€™s motherâ€™s home and then moved to a little house on Lincoln Street. From there came children and grandchildren, a construction and ranching empire, and of course, the world-famous Madonna Inn. And then Alex passed away in April of this year. Today, Phyllis can be found sipping cappuccinos in the same restaurant booth at the inn from which she and her husband oversaw their empire. The walls of the booth are lined with the same memorabilia thatâ€™s always been there. A phone still sits at the ready. On a recent sunny December morning, Phyllis ordered coffees for a couple of guests and told them about this yearâ€™s Christmas decorations at the inn â€” in particular, two 15-foot-high bronze cherubs she bought last month on the East Coast. I was [in North Carolina] for an entirely different reason; I was looking for furniture for different rooms [at the hotel]. But I saw those giant cherubs and Alex loved cherubs, as I do. We both love little babies, angels. And when I saw this, I started crying. Because it was Alex. He was there with me. I thought, I know what I can do with those. Iâ€™ll put them on each side of the gate at the bottom of the road that goes up to the [new conference center]. What I want to do is put a banner from cherub to cherub that says â€œAlex Madonnaâ€™s Expo Building.â€? Iâ€™ve always loved bronzes, and now that Alex isnâ€™t here Iâ€™m sort of the matriarch. You know, taking over because I had to. Itâ€™s amazing to me to see the strength that I was able to come up with. Because I never thought I could carry on â€” I thought I would go first. But by God, Iâ€™m doing it. Iâ€™m doing it. And the more problems that come up, the stronger I get. I conquer each one, one at a time. My children are so behind me and theyâ€™re so proud of me. My son, and my three girls, and the son-in-laws and my daughter-in-law â€¦ Iâ€™m so fortunate that I have these good kids. You have such a strong support system with them. If you have support, you can do anything. And Iâ€™ve shocked every one of them. It wasnâ€™t that I was a follower; it was that I supported Mr. Madonna 100 percent in everything that he did, whether he was right or wrong. He was my hero and I supported him. That alone made me strong. Your marriage was very different than what younger generations have today. Do you think theyâ€™re missing something that you and Alex had? I think that every generation gets better. And every generation has its downfalls. I mean, weâ€™ve gotten into drugs and all kinds of things. But at the same time, instead of the woman being, (pause) how can I put it â€¦ The men ruled with an iron hand. And I see my girls fighting their husbands and saying, â€œI donâ€™t agree.â€? I say, â€œOh! How can you do that? Heâ€™s your husband!â€? You see, in my generation you donâ€™t question your husband. So I think really and truly that [the younger generation] is better. It equalizes you out. Youâ€™re equal, man and woman. And it makes the marriage stronger. I believe that. Maybe Iâ€™m right, maybe Iâ€™m wrong. At my age, Iâ€™m able to look back. They say the older you get the wiser you get, and I really think Iâ€™m quite a bit wiser then when I was a teenager. Youâ€™ve always called your husband â€˜Mr. Madonna.â€™ Do you find that confuses younger generations? I resent people saying, â€œAlex said this. Alex that. Alex something or another.â€? That is disrespectful. I respect my husband and I might call him Alex personally, but [in public] I call him Mr. Madonna. I think thatâ€™s maybe old-fashioned, but itâ€™s a sign of respect. Earlier you were talking about how your Christmas decorations change from year to year, and Iâ€™ve noticed that the hotelâ€™s billboard is also new. Isnâ€™t it fabulous? My daughter, Connie Pearce, is the one who did that. The first one we put up, we all thought it was nice but none of us liked it that well. If you never do anything new, you never make any mistakes. This billboard out here, I just adore it. Itâ€™s picturing the Inn how Alex and I pictured it and the way we liked it: as a family tradition. Thatâ€™s our new logo. Our family has lost the most important part and so now we gather strength from one another. Weâ€™re going on; weâ€™re going on to bigger and better and higher things. Weâ€™ve got absolutely fantastic plans. Weâ€™re redoing the ladiesâ€™ restroom downstairs from the Copper CafÃ©. Itâ€™s tiled from floor to the ceiling. Everything is automatic. You put your hand under the soap dispenser and soap comes out. You put your hand under the faucet and water comes out. You stand up from the toilet and it flushes. I love it. Thatâ€™s not something you imagined when you first started building the Inn. Youâ€™ve got the new conference center, too. That is going to be absolutely gorgeous. When weâ€™re finished, you wonâ€™t know what it was. Alex put on the front and he always said it was a butler building with a Swiss attitude. Itâ€™s enormous. Weâ€™re going to build a kitchen out on the side; weâ€™re going to have meeting rooms upstairs. I think one of my first big events will be there in March, for the womenâ€™s shelter. Whatâ€™s the goal of that building now, to be the largest conference center in the county? I think thereâ€™s always been a demand for something that big. You can get conventions from all over the United States. Weâ€™ve had people asking [for it], and it will bring revenue to the city. And itâ€™s something we wanted to build to have Alex look down from heaven and be very proud of what we have done in his name and in his honor. It doesnâ€™t sound like youâ€™re slowing down at all. You know, I have to go faster now. Alex and I were partners; we worked together in everything. And now that Iâ€™m missing my partner, Iâ€™m running faster than ever. But itâ€™s really the secret to getting over the grieving. Itâ€™s very, very difficult. Itâ€™s very lonely and sad. When I can keep my mind going and know that I have this goal and that goal that I have to complete, Iâ€™m really happy. I like challenges; I like being busy; I like creating and decorating. What did you learn about yourself through that grieving? 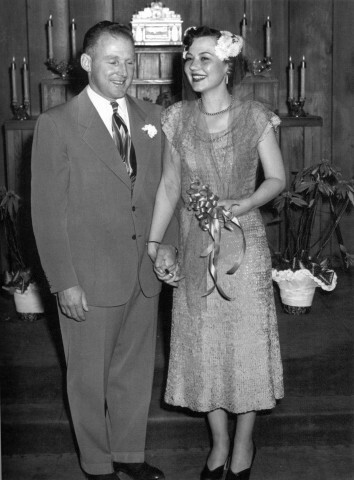 CHRISTMAS BRIDE: Alex and Phyllis Madonna were married on Dec. 28, 1949 at the Little Church of the West in Las Vegas. #The greatest thing that Iâ€™ve learned is that I was able to muster up strength that I never thought I ever had. When you have two of you, you support one another. When thereâ€™s one, who have you got? Except my family and my children â€” theyâ€™re wonderful. But Iâ€™m the one who makes all the decisions. So I have to not be afraid. And Iâ€™m not. Iâ€™m not afraid. I love it. Mr. Madonna always made the decisions. Well, we talked about it, but he was the final word. Now thatâ€™s shifted to me and I am the final word. Itâ€™s invigorating; itâ€™s challenging; itâ€™s exciting. Itâ€™s something I never had. At first, very scary. But you go from day to day. If I worried what was going to happen in the future, that would be no way to live. I think all of us, whether youâ€™ve lost someone or not, should appreciate each day and be thankful for what we have. None of us are born equal â€” someone is a great athlete, another a great mathematician. Some people are born with a great heart. Itâ€™s important to make the most of what youâ€™re born with. And if you do that, great things come to you. You canâ€™t be wishing for this or that. You have to stand on your feet and have confidence. See, I never was a mathematician; Mr. Madonna was great at that. So he did all of the figuring and I did all of the fun, beautiful decorating. The artistic side. Your family has made some changes to the business, particularly the construction side, over the last year. What happened? I closed the construction completely down. We still have a small job in Cambria thatâ€™s almost finished. Construction business is something that I donâ€™t know anything about. And if youâ€™re jumping into an area that youâ€™re a stranger in â€¦ Mr. Madonna did construction work and I was here every day. We met for lunch and dinner. I just thought it was wiser for me to shut it down. We only had this one job anyhow and so it wasnâ€™t like we had this huge group of people that weâ€™d retire. It would have been very difficult for me to close it down because so many of them are my friends. I think in closing it, I like to think I did not hurt anyone. Will that side of the business ever be reborn someday? Well, you know my son has his own construction business and he bought some of Mr. Madonnaâ€™s construction equipment. And my son-in-law bought some. And my daughter and son-in-law from the Carrizo Plains, Cathie and Rowly Twisselman, they bought the horses and the cattle. See, Iâ€™m not into horses or cattle either. That was their love and they understood it. They breed the horses and sell them and train them. So your focus is the Inn. Youâ€™ve really become the figurehead here. What Alex and I created together is the Madonna Inn. My daughter, Connie, is managing and has been managing the Inn for a long time. Sheâ€™s been here for 22 years. Sheâ€™s very comfortable; this is her home. All of my children are doing very well. But theyâ€™re all grieving too. We all have our days. We all have our days where we want to get it all out and cry and cry. Itâ€™s normal. Without any warning or notice something will happen or something is said that triggers your deep-down inner emotions. And you just lose it. Just like when I saw those cherubs, there were people all around me and there I was, tears rolling down. But youâ€™d be surprised how many people have empathy; how many people have lost a child, a mother, a husband. They understand. Thereâ€™s something beautiful about having people understand what youâ€™re going through. And so many do. Weâ€™re all born to die. If you had to point at one thing and say, â€œThis is Alexâ€™s legacy,â€? what would that be? The Madonna Inn. It represented us as a pair, as a couple. We loved each other and it was built with love. Maybe thatâ€™s why we loved cherubs, because they represent love. Has this holiday season been harder since itâ€™s the first one without Mr. Madonna? Itâ€™s only been seven months since he died. Everything is hard. I make it sound like itâ€™s easy. I plan on having it become easier as the years and months go on. Some people, I think, are not able to conquer their grief. I think thatâ€™s very sad. Iâ€™ve known some people that just vegetate. I think you have to keep your mind stimulated, and if you do that, youâ€™ll be okay. Fortunately, I think God gave me the gift to be able to carry on even through the grieving. He was such a wonderful man; he was my angel. Kind and good and giving. He loved people. He was stubborn because he has his own opinions and ideas. But he would never hurt anyone. Thatâ€™s the thing Iâ€™m so proud of; he would never hurt anyone. He was such a loving man. What will never change at the Inn? (Long pause). It will always be the same. I may embellish it, I may add to it. My plans are to make it better and better and better, but I will never change it. You know you can make things better and create more beauty, but I donâ€™t want to ever change it. This was a partnership that Alex and I created together, and I donâ€™t think any of my children want to change it either. None of us really know whatâ€™s going to happen to us tomorrow. Alex didnâ€™t know that he was going to die the next day â€” he was well and healthy. We just have to enjoy each day. Have self-esteem and know that you can do it â€” know that you are as good as the next man. Thatâ€™s what my father taught me, youâ€™re just as good as the next person.